There is no the unquestionable name of the ancient city of the planet. The encyclopaedist Beruniy and the scientist Makhmud Koshgariy discussed about the name Samarkand in XI century. There are many versions. They are all based on the linguistic suppositions, records about Samarkand in the chronicles and written sources of different times and nations, legends.Assuming that the name of the city consists of two words, people resorted to the simplest explanation, linking these two words with two proper names or with one, and under the intended interpretation they summed the legendary foundation. There is a version that Samar dug a spring here and drained it, soon near the spring many people lived and gradually the town appeared. 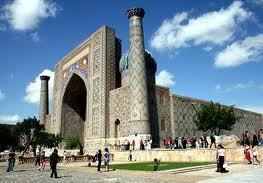 The thankful citizens called the settlement “Samarkand”, that means “Samar dug”. It is also said that the town is so called by the name of scientists-magicians Samar and Kamar, who lead its construction. And the prefix “kand” from “kent” means “settlement”, “city”. There is a drama history telling about sweethearts – young man Samar and girl Kand, in honor of which the first settlements were built on the city place. There are also legends about the sweetheart of Alexander the Great – Samar, in honor of which the city (kand) was named. The city was built by the order of Alexander the Great. The name of the city originated from the expression “Samar demolished” after the Kashgar tsar Samar-baky encroached upon the Zarafshan valley, occupied Samarkand and ruined city walls. The historians and linguists point on that “Samarkand” origins from Turkish “Simiz kent”, that means “Rich settlement”. The medieval Chinese sources (calling Samarkand “Si-mi-se-kan”, explaining that it means “rich city”) inform about this. The Armenian chronicler of the XIII century Sumbat tells that “Smarand” means “fat or fertile city”; the Spanish ambassador in court of Temur Ruy González de Clavijo, famous for the description of his trip, wrote about Samarkand as about “Samarkand”, but he stipulated that the real name was “Simeskint”, that means “rich settlement” and etc. 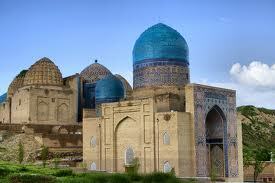 Samarkand could also origin from Hebrew “Meru-kand” (“Holly city”). “Marakanda” – the Greeks called Samarkand by this name, could origin from Hebrew “Maurakand” (“City on the river with vegetation-covered shores”), that is real enough, taking into consideration the fact that Samarkand is based on the river Zeravshan with tugai-covered shores. “Marakanda” can also mean from Hebrew “blessed city” or “city with good climate, in which there are many fruits and greens”.